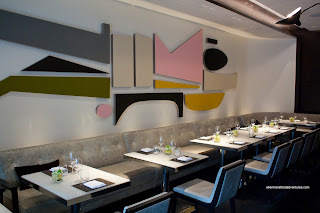 Ever since the first time I heard that David Hawksworth was scheduled to open his restaurant in the renovated Georgia Hotel (at the time, it was under renovations and still ongoing today), I was planning my future visit. Little did I know that my visit would take place over a year later. You see, Hawksworth was supposed to go live in late 2009. Fast forward to mid-2011 and the place has only been open for a couple of months. Well, better late than never. It seemed like the refurbishing of the Hotel Georgia was taking longer than a total rebuild (which can be the case, I've been told). Well, one look at the decor of the place and it is quite obvious that a total transformation has taken place. Gone are the traditional furnishings. They have given way to a modern look which has a very New Yorkish feel to it. So why was there so much anticipation for this restaurant? Well, it has a lot to do with David Hawksworth. Formerly of West, he was awarded Chef of the Year in 2005 by Vancouver Magazine and inducted into the BC Restaurant Hall of Fame in 2008. However, for most people, they can recognize him from his appearances on the Food Network. For me at least, it is all about the food. Nothing really matters much if the food isn't good. So when I got the chance, I rounded up the whole family for an elegant lunch at Hawksworth. And when I say whole family, I mean the kiddies as well. You see, being in a hotel, they have a kid's menu. Score! Normally, the lunch menu at most fine dining establishments are slightly less expensive than dinner. In this case, it was about $2.00 less per entree. 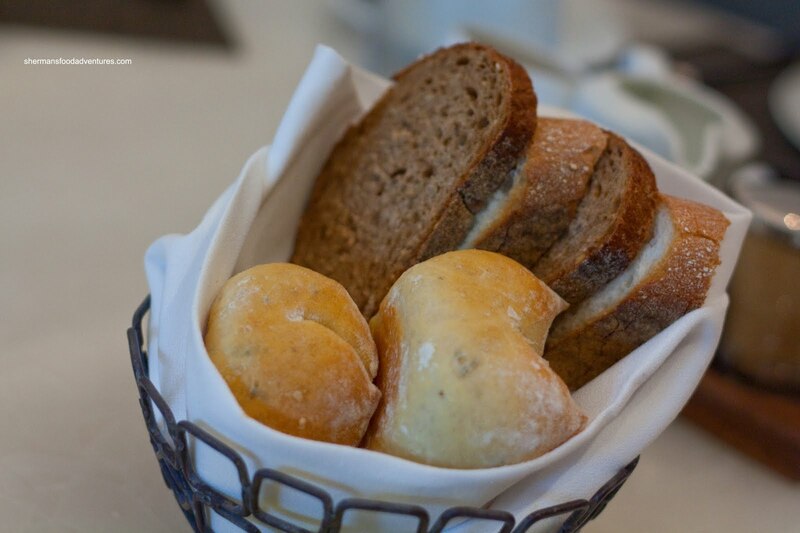 The one peculiar thing on the menu was the charge for Bread. It was $4.00. Hey, it was good bread and high quality olive oil; yet not being complimentary caught us off guard. At the top of the menu, there was a selection of zero proof drinks. Viv had the Aloe Vera which resembled a mojito when it arrived. In certain aspects, it did taste like one due to the mint. However, there was no mistaking this was aloe vera with the chunks of jelly (much like the Asian drink). Except for the kiddies and my dad, we all started with appetizers. 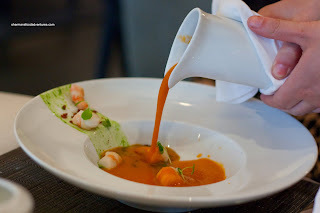 My mom had the Roasted Tomato and Fennel Soup with spot prawn, bacon and basil served table side. The soup was packed with flavour from the tartness of the smoky tomatoes exhibiting only a hint of fennel. The spot prawns were cooked perfectly being delicate and sweet. The added hit of herbiness from the basil and saltiness of the bacon provided balance. For myself, the Dungeness Crab Salad caught my eye. It turned out to be the right decision. 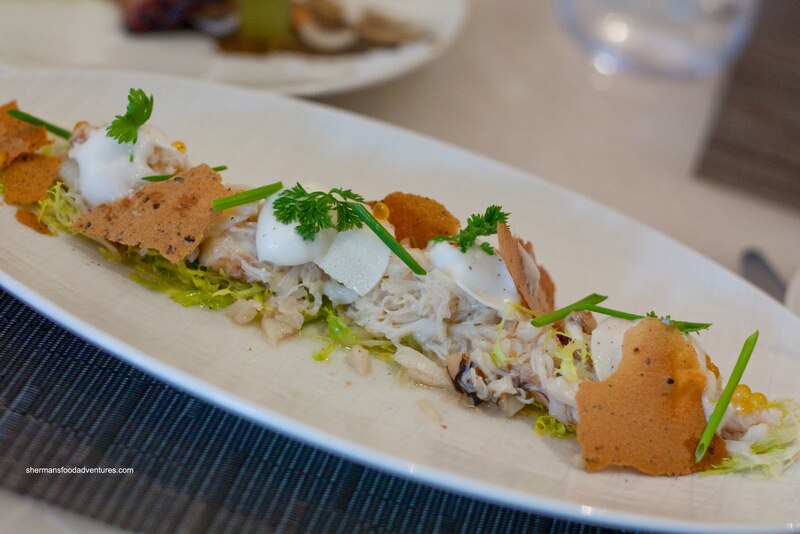 Resting on a bed of celery leaves was a plethora of perfectly cooked crab meat. It was sweet and delicate. Thinly sliced heart of palm, chives, parsley, roe and lemon foam finished the plate. I thought the amount of acidity in the salad was perfect. It really made the flavours pop which livened everything else. 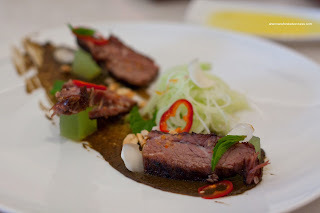 Viv had the other appetizer that I had my eye on, which was the 48-Hour Beef Shortrib with black pepper jam, honeydew, green papaya, red chili, peanut and Thai basil. There may have been only 3 pieces of shortrib on the plate; but there was a lot of impact nonetheless. The meat was super tender and bursting with flavour. The black pepper jam really had a punch which was accented by the sweet honeydew cubes and tart green papaya salad. As if the shortrib wasn't enough meat, Viv had the Roasted Hanger Steak for her main. It was served medium-rare (the only way it should be prepared by-the-way) and served with chimmichurri, arugula salad and thrice cooked frites. 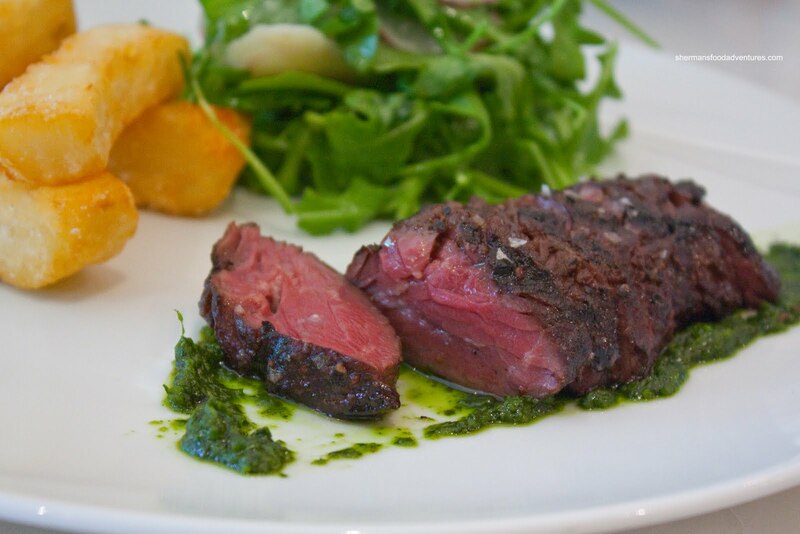 The reason why a hanger steak should not be cooked past medium-rare is due to the cut of meat. It is typically a bit tougher while being quite flavourful. This particular steak was cooked beautifully where it was both very tasty and remarkably tender. The chimmichurri sauce was not particularly impactful; but it didn't need to be. It added only a faint level of garlic and saltiness to the steak. As for the frites, they were large, crispy and very potatoey on the inside. There weren't a lot of them on the plate and it wasn't necessary either. They were quite heavy and filling. For my main, I had the same frites which accompanied the Hawksworth Beef Burger. 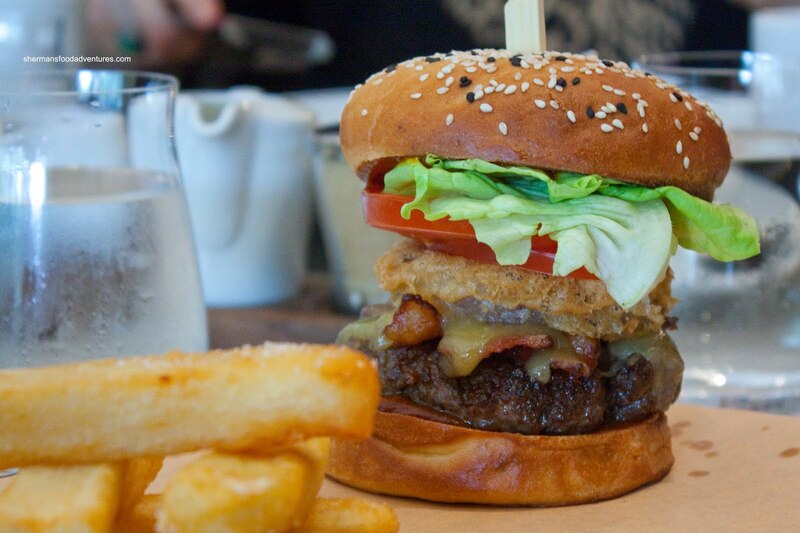 I know, I know... A burger at a fine dining establishment? I've done it before, when DB Bistro was still open. 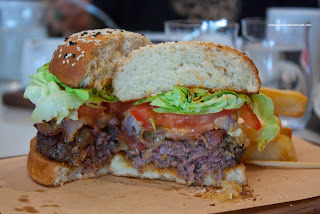 However, this time around, the burger didn't have things like shortrib, foie gras or truffles in it. It was just a plain burger with applewood smoked bacon, aged cheddar, tomato, butter lettuce, spiced mayo and a fried red onion ring on a toasted sesame (and black sesame) bun. Hold on there, there is one thing that makes it really special - the fact you can get it cooked medium-rare. Yup, they can do that. Since they prepare their own burger patties as you order them, it is safe to cook it less than well-done. Therefore, the quality of the meat combined with the medium-rare preparation results in an extremely moist and juicy burger. Something that is a rarity these days (pardon the pun). Not since my visit to Chee Chee burger in the States have I had ground beef prepared this way. My mom always looks for the lamb dish on any menu and since the Tagliatelle was the only item with it, her decision was easy. 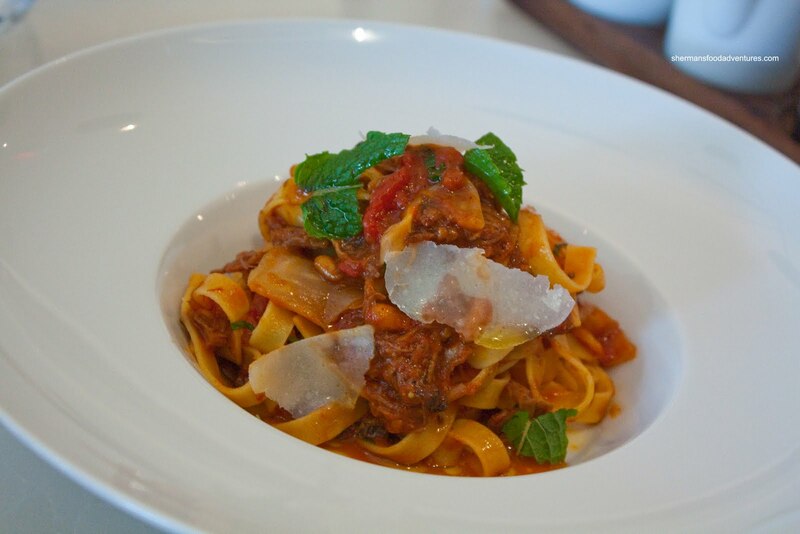 It consisted of slow cooked lamb, tomatoes, sundried olive, pine nuts, shaved Parmesan and mint. Despite the large amount of pulled lamb, the whole pasta was not gamy. There was only a hint of lamb flavour, which was enough in this application. 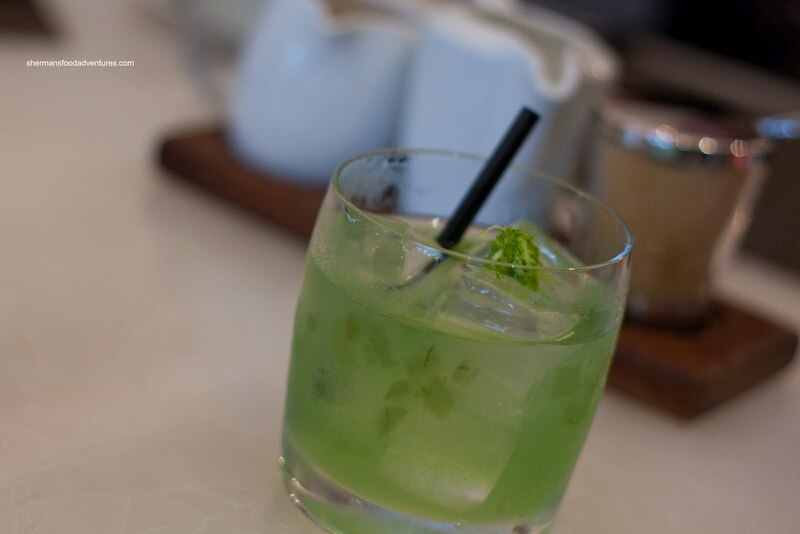 There was a pronounced tartness from the olives and strong impact from the mint. There wasn't enough pine nuts to add anything significant to the dish. The pasta was al dente and slowly started absorbing the excess cooking liquid from the sauce. At first, I thought there was too much liquid; but as we ate the tagliatelle, it disappeared. 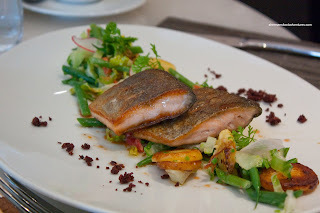 My dad had the Pan Seared Sooke River Trout with fingerling potato, haricot vert, olive and brown butter. First of all, the fish was cooked perfectly. Flaky and moist flesh welcomed us as we enjoyed the crispy skin on the exterior. The fish was seasoned just enough to add flavour without being overpowering. It allowed the brown butter to do its thing. The accompanying veggies were cooked perfectly with crisp green beans and crispy potatoes. I'll give you one guess what my son had. Yes, he had the Mac 'n Cheese. 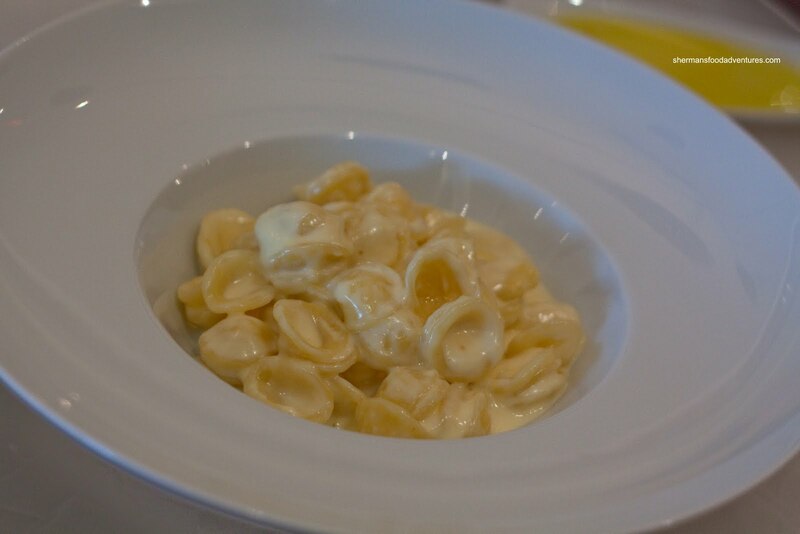 Well, in this case, it was more like orichetti & a blend of cheeses. 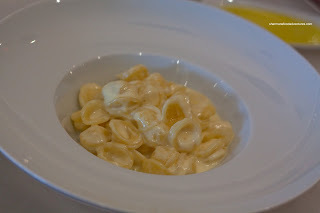 The orichetti was al dente which is a nice departure from overcooked pasta usually associated with mac 'n cheese. The blend of cheeses was really tasty. It was creamy with a bit of sharpness. We suspected there was some Gruyere in there. My son loved it, he ate it without protest. For my daughter, she had the Cheese Pizza. 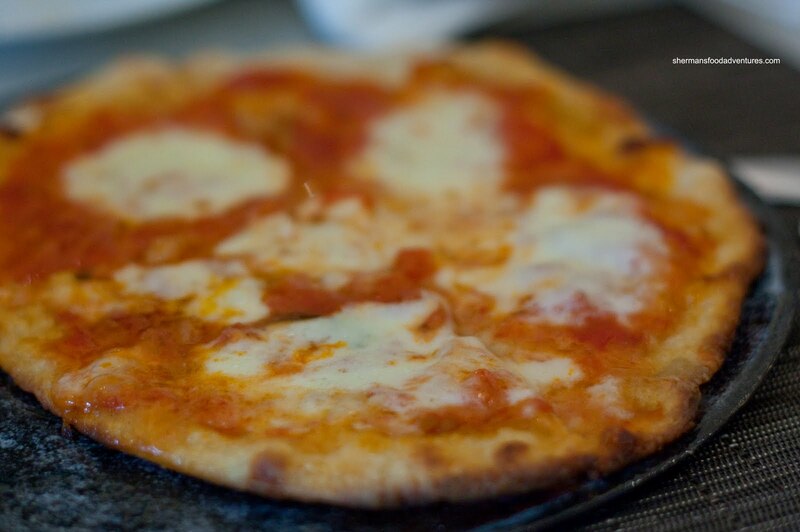 Reminiscent of a pizza Margherita sans the basil, this was actually very good. The crust was crisp an d only a bit soft at the centre. The fresh mozzarella and tomatoes really made this pizza gourmet compared to most kids pizzas around. Granted, this one cost $14.00! It better be good! At this point, we were debating whether to have dessert or not. Surprisingly, Viv was leaning towards dessert. Was she possessed by Mijune? Whatever the case, we decided to share 2 beginning with the Yogurt Panna Cotta served with grapefruit segments, orange coulis, grapefruit sorbet and a basil lemon gelee. The yogurt itself had vanilla bean as well. 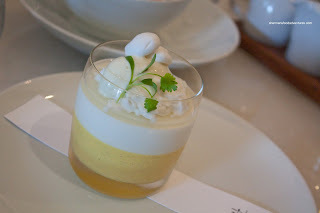 This was an extr emely refreshing dessert. 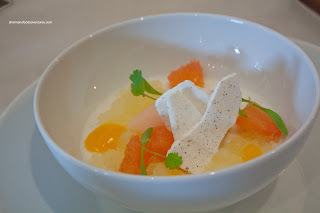 There was a whole lot of tartness going on from the yogurt and citrus elements. Yet, there was enough sweetness to balance it out. For our second dessert, we tried the Mango Custard with vanilla bean, coconut and lime. This was a very light offering which was not particularly sweet. This suited me just fine since I can't stand overly sugary desserts. The mango custard was very smooth and aromatic while the tang from the lime made up for the lack of zing from the mango. The little meringues provided a textural contrast to the custard. If I had to describe this meal with one word, it would be "solid". The execution level was high and the attention to detail was evident. Despite what appears to be high menu prices, I thought it is fair considering the location, the chef and the level of refinement. Of course, by virtue of having a kids menu, it suddenly makes it alright for families to dine here. However, the "kids meals" can be deemed expensive. The service we received was generally attentive and consistent. If we take everything into account, it appears that Hawksworth is a winner. The sweetbread is amazing. Try it the next time you go. The service was top notch as well during my visit! That burger and fries look like the same one on the Cosby Show when Cliff took Rudy and her friends to a fine dining restaurant. Thanks for the shout out Sherman! I was excited to read this.. k lets see if I can remember everything I wanted to say. 1. Viv is a carnivore! It's pretty great! I've had my eyes on that s48 hour braised short rib since I saw the menu. It looks a bit dry, but glad to hear it wasn't. 2. U read my mind about the burger... even when you told me on the phone I was like huh? why did you order the burger? I'm kind of glad it didn't have the whole foie gras thing.. it's kind of played out now I think. What kind of bun? 3. The trout looks perfect and the portion looks pretty big. I've never been a fan of chimuchurri sauce either. 4. Charging for bread without telling you? For me that's a major no no for fine dining. If C, Cioppino's, La Belle Auberge & Cin Cin don't charge... I don't see why Hawksworth should.... even if it's home made. 6. The desserts seem really asian to me... unless you guys happen to order the more asian style desserts. 7. Great post as always. @Olive Will do, I love Sweetbreads! @FMF Yah, the short rib does look dry doesn't it? It's actually not so. It isn't juicy either, but it isn't supposed to be. Our server did ask if I wanted to "order" bread and I said yes. I actually knew the cost. But I don't like that we had to pay. Thanks for posting Sherman. Hope to try this summer. @604Foodtography Yes, it is a must try. Very solid meal all around. Had brunch there: I had both the burger and the pancakes. I prefer the burger, OF COURSE. Service at the restaurant (stayed there for about 4 hours!) and the rest of the hotel was great. @TS Glad you enjoyed it. I need to go for Breaky too I believe or that steak for 2. I am going to try this restaurant. Good review.